1996-07-18 First worldwide family litigation filed litigation Critical https://patents.darts-ip.com/?family=26299077&utm_source=google_patent&utm_medium=platform_link&utm_campaign=public_patent_search&patent=EP0518610(B1) "Global patent litigation dataset” by Darts-ip is licensed under a Creative Commons Attribution 4.0 International License. The present invention relates to glass compositions and, in particular to glass compositions which are of minimal toxicity and are substantially free of lead and cadmium and which can be used as fluxes for mixing with pigments to provide compositions for the decoration of ceramic materials and/or glass. Occasional episodes of lead poisoning have resulted from the use of improperly formulated and fired lead containing glasses and/or fluxes on ceramic ware. Whilst lead containing glasses and fluxes can be prepared which are safe, and meet current requirements for permissible lead release to food with which they come into contact, the problem of lead poisoning is avoided if lead itself is avoided. In addition, various pollution controls regarding the use of lead and limits on the content of lead in waste water can be avoided by the use of lead-free glazes and fluxes. Various attempts have been made to produce lead-free fluxes for mixing with pigments to provide compositions for the decoration of ceramic material and glass. US-A-4282035 and US-A-4446241 disclose Pb- and Cd- free glass frits for use in enamels which are based within the R₂0-R0-Al₂0₃-Zr0₂ (where R₂0 is an alkali metal oxide and R0 is an alkaline earth metal oxide) and Li₂0-B₂0₃-Si0₂ systems, respectively. US-A-4590171 describes Pb-and Ca- free glass frits suitable for use in enamels in contact with foodstuffs which contain Li₂0, Na₂0, Ba0, B₂0₃, Al₂0₃, Si0₂, Zr0₂ and F as essential ingredients. While all the aforementioned glasses are alleged to have many desirable properties, their widespread use as glassy fluxes is limited by shortcomings in certain key areas. A glossy flux to be used for on-glaze enamel decoration must simultaneously satisfy a number of key requirements. Firstly, the softening point of the flux should be such as to allow maturation within the temperature range of from 750° to 900°C, which are typical on-glaze enamelling temperatures for decoration on bone china, earthenware or hotelware pieces. Secondly, the glossy flux should be compatible with a wide variety of colourants. Thirdly, the glassy flux should display good resistance to devitrification and to pronounced opacity during a conventional enamel firing schedule in order to promote good colour development with a glossy finish. Finally, the durability of the glassy flux should be such as to enable the fired colours to withstand attack by acidic foodstuffs and alkali detergents. With controls on permissable levels of metal release into acidic and alkali solutions becoming more stringent, more exacting demands are being placed on the durability requirements of decorated pieces. In the light of the present invention, it is important to stress that it is the durability of the final product, i.e fired colour, which is of concern, not that of the glassy frit which may change in use. The core glass system for US-A-4554258 and US-A-4892842 is R₂0-Bi₂0₃-B₂0₃-Si0₂ whilst for EP-A-267154, it is Na₂0-Zn0-B₂0₃-Si0₂. The basic glass system of the present invention is R₂0-Zr0₂-Bi₂0₃-B₂0₃-Al₂0₃-Si0₂ and is outside the scope of the prior art both in terms of the core glass-forming systems and in terms of the precise compositions themselves. We have now developed a glass composition which can be used as a flux which simultaneously meets, or at least substantially meets, the aforementioned key requirements. with the proviso that ZnO and BaO are each not contained in an amount of more than 2 mole percent. The glass composition of the present invention preferably comprises from 50 to 70 mole percent of Si0₂, still more preferably from 50 to 65 mole percent of Si0₂; from 1 to 3 mole percent of Al₂0₃; from 8 to 25 mole percent of R₂0, more preferably from 8 to 22 mole percent of R₂0, still more preferably from 12 to 22 mole percent of R₂0. The Zn0 and Ba0 contents of the glass compositions of the present invention are preferably each less than 1.0 mole percent, more preferably each less than 0.5 mole percent. A more preferred glass composition of the present invention containing a rare earth oxide preferably comprises from 50 to 65 mole percent of Si0₂; from 1 to 3 mole percent of Al₂0₃; from 8 to 25 mole percent of R₂0, more preferably from 8 to 22 mole percent of R₂0, still more preferably from 12 to 22 mole percent of R₂0. When a rare earth oxide is used in the glass composition of the present invention it is preferably lanthanum which is preferably used in an amount of from 0.5 to 3 mole percent. The composition of the present invention contains ZrO₂ in order to improve the resistance of the compositions to attack by alkali and detergent solutions, and preferably contains TiO₂ in order to improve the resistance of the compositions to attack by acid. The preferred amounts of ZrO₂ and TiO₂ for use in the glass compositions of the invention are 0.1 to 3.0 mole preferably for Ti0₂, and 0.1 to 6.0 mole percent for Zr0₂, preferably 0.1 to 3.0 mole when the compositions contain a rare earth oxide. The glasses of the invention can be prepared from natural (benificated) rocks and minerals e.g. limestone, silica sand etc. as well as "fine chemicals". The various minerals and/or oxides used in the preparation of the compositions of the present invention are usually in the form of fine powders. Precursors of these oxides can also be useful, providing that they decompose to form the required oxides at temperatures below the melting temperature of the glass. Suitable "fine chemical" precursors are the nitrites, nitrates, carbonates, metal organic salts, for example citrates, acetates, etc. The glass of the present invention may be prepared by mixing together materials, charging the mixture of materials to a glass melting furnace at a temperature sufficiently high to produce the fluxed glass and then fritting the glass by pouring it into water, or by passing it through water cooled rolls. It may be preferred to carry out the melting and fritting operation in an oxidising atmosphere, or to include a oxygen rich component in the mixture which is melted and fused. The frit may be ground into a powder by conventional grinding techniques. The glasses of the present invention are preferably fluxes which are used in combination with one or more pigments as a colour on ceramic materials or glass. It will be understood by those skilled in the art that for use as a flux, the glass compositions must mature or yield a smooth continuous surface at temperatures below the melting temperatures of the glazes on the ceramic articles on which they are to be used. Generally, the glass compositions will melt at a temperature of below 1150°C, preferably at a temperature in the range of from 900 to 1100°C. The present invention thus includes within its scope a composition for the decoration of ceramic materials and/or glasses which comprise a glass frit as hereinbefore described in admixture with one or more pigments, or other colourants such as metallic crystallites. The compositon for the decoration of ceramic materials and/or glass may additionally contain a plastic binder therein. The fluxes of the present invention are compatible both with conventional glazes on ceramic materials and with the bismuth based glazes which are described in our published European Patent Application No. 452 065. The fluxes of the present invention give good colour development, i.e. the colour of the pigment is bright and "sharp" and is not adversely affected by the flux. As mentioned above, the glass frits of the present invention preferably contain lanthanum which may improve the colour development of the fluxes and the alkaline durability. The present invention will be further described with reference to the following non-limiting Examples. The coarse frit was ground to give a particle size distribution of 90% less than 16 micrometres. Using a pigment to glass frit ratio of 1:4 by weight, green (chromium oxide) and brown (doped iron oxide) colours were prepared, silk-screen printed and fired onto bone china glazed with a traditional unleaded glaze and with the glaze as described in our published European Patent Application No. 452 065 at a heating rate of 13°C per minute to 820°C, with a dwell time of 20 minutes. The fired colours were glossy and displayed acceptable durability. The coarse frit was ground, blended with an equal weight of a brown pigment (doped iron oxide) and fused at 800°C for 10 minutes. The resulting fused mass was ground to give a particle size distribution of 50% less than 16 micrometres. The brown colour was printed by lithographic methods and fired on bone china glazed with a traditional unleaded glaze using a heating rate of 13°C per minute to 820°C and on bone china glazed with the glaze as described in our published European Patent Application No. 452 065 using a heating rate of 16°C per minute to 800°C with a dwell time of 20 minutes in both cases. For both types of glaze surfaces the resulting colours were glossy and displayed acceptable durability. Following fritting, the coarse frit was ground to give a particle size distribution of 90% less than 16 micrometres. The powdered fluxes were then tested by means of a "Flow Trial". This is a standard test used to give a measure of the melting and flow (viscosity) characteristics of a flux, whilst also providing information on its stability, i.e., resistance to devitrification and phase immiscibility. For the flow trials, 1.5g of flux powder was dry pressed into a disc and placed in a circular slot at the mouth of a flow channel in a flow trial slab. The slab was mounted at an angle of 33 degrees and fired at a ramp rate of 4°C per minute to 750°C, with a dwell time of 1 hour and a cooling rate of 4°C per minute. The extent of flow was measured as a percentage of the flow undergone by a 'standard' flux under identical flow trial conditions. The 'standard' flowed to a length of 24 mm in the flow trial test. Following the procedure of Example 1, fired green and brown colours were prepared. Both alkali and acid durabilities of the fired colours were assessed. For the alkali test, the test conditions were immersion for 7 hours in a concentrated solution of a sodium phosphate - based commercial detergent held at 77°C, giving a pH = 13. The acid test involved a 100 hour immersion in a 4% acetic acid solution at 25°C, giving a pH = 4. 1 = No visible loss of colour or gloss. 2 = Some loss of gloss and possible fading of colour. 4 = Gloss removed and some loss of colour. 5 = Considerable attack causing removal of colour. 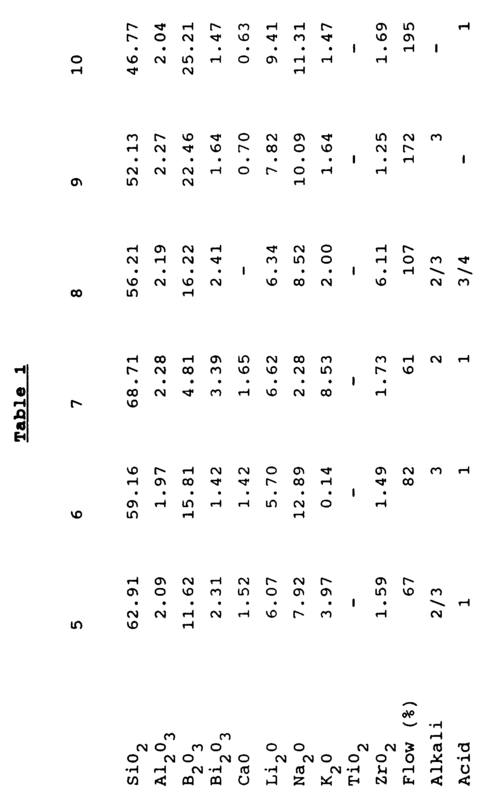 Following the general procedure of Example 1, glass frits were prepared having the compositions detailed in Table 1 below, the amounts of the components being expressed in mole percent. The flow values and alkali and acid resistance were assessed by the procedures as detailed in the preceding Examples 3 and 4. 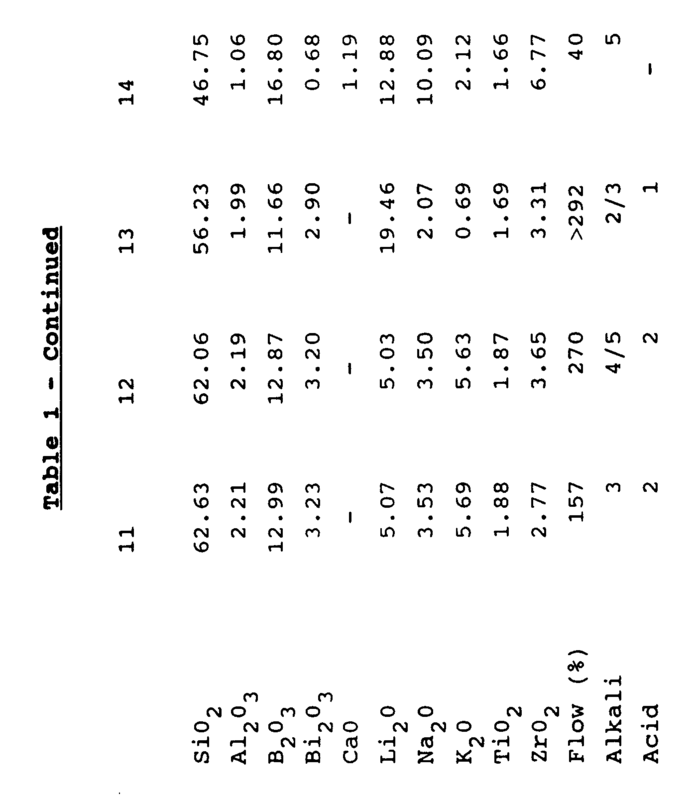 Following the general procedure of Example 1, a glass frit was prepared having the composition detailed in Table 2 below, the amounts of the components being expressed in mole percent. A glass flux composition as claimed in claim 1 which comprises 50 to 70 mole percent of Si0₂, preferably from 50 to 65 mole percent of Si0₂. A glass flux composition as claimed in claim 1 or claim 2 which comprises from 1 to 3 mole percent of Al₂0₃. A glass flux composition as claimed in any one of the preceding claims which comprises from 8 to 25 mole percent of at least one of Li₂O, Na₂O or K₂O, or a mixture thereof (R₂0), preferably 8 to 22 mole percent of R₂0, more preferably 10 to 22 percent of R₂0. A glass flux composition as claimed in any one of the preceding claims which includes from 0.1 to 6.0 mole percent of ZrO₂. A glass flux composition as claimed in claim 6 which comprises 50 to 65 mole percent of SiO₂. A glass flux composition as claimed in claim 6 or claim 7 which comprises from 1 to 3 mole percent of Al₂0₃. A glass flux composition as claimed in any one of claims 6 to 8 which comprises from 8 to 25 mole percent of at least one of Li₂O, Na₂O or K₂O, or a mixture thereof (R₂0), preferably 8 to 22 mole percent of R₂0, more preferably 10 to 22 mole percent of R₂0. A glass flux composition as claimed in any one of claims 6 to 9 which includes from 0.1 to 3.0 mole percent of ZrO₂. A glass flux composition as claimed in any one of the preceding claims wherein the rare earth oxide is La₂O₃. A glass flux composition as claimed in claim 12 which comprises from 0.5 to 3 mole percent of La₂O₃. A glass flux composition as claimed in any one of the preceding claims which includes from 0.1 to 3.0 mole percent of TiO₂. A composition for the decoration of ceramic materials and/or glass which comprises a glass flux as claimed in any one of the preceding claims in admixture with one or more pigments, or other colourants. A composition as claimed in claim 14 which additionally includes a plastic binder therein. A ceramic or glass article which has been decorated using a composition as claimed in claim 14 or claim 15. ES2110570T3 (en) * 1992-07-01 1998-02-16 Proceram Compositions and transparent vitreous ceramic articles, free of lead.